RENT A CASTLE FOR THE SPECIAL EVENT OF YOUR DREAMS! 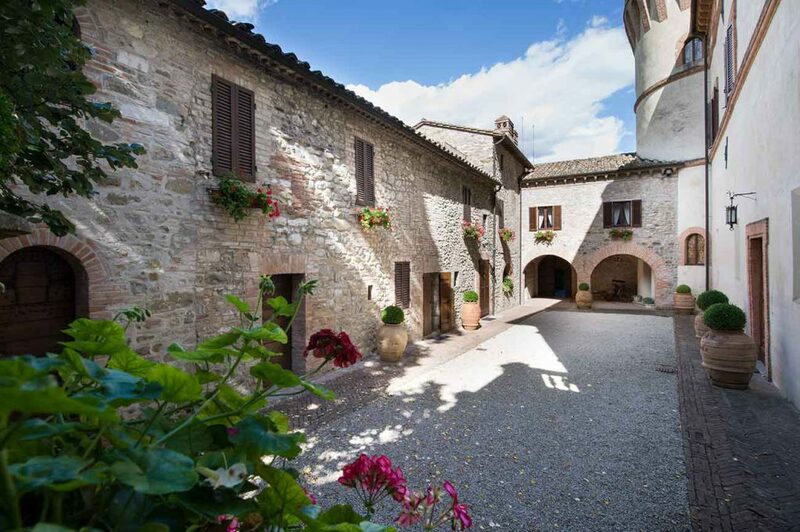 Both our castles have received authorization by the City of Perugia to celebrate legally valid civil marriages. The “Castello di Bagnara” is a magnificent medieval castle located in the Tiber Valley, in the centre of the 1500-acre historic Bagnara Estate, at 1 km distance from the villas. It is made up of a complex of several buildings built from the 11th century in the shape of a “Y”. It was created with the construction of a building in the shape of an “L”, used as a dwelling, with a square tower on the longer section, rooms with vaulted ceilings, and a stone mill. Later, in the 14th century, they built a round Tower-Palace connected to the older part. At the time, in fact, they began to build round towers, being more defensible from cannon attacks; the large size of the tower’s circumference shows that it was higher than it is at present – although they couldn’t find historical evidence on its function. At the end of the 1400s, they built the so-called “Palazzo di Bagnara“, attached to the tower which was then lowered and embattled. The new part has 3 floors connected by a Renaissance style spiral staircase, built inside a second smaller tower. Inside, it features vaulted ceilings between the ground floor and the first floor. Simultaneously, they built a square tower in the east area of the garden, which has now been lowered, and served as a lookout for the palace. 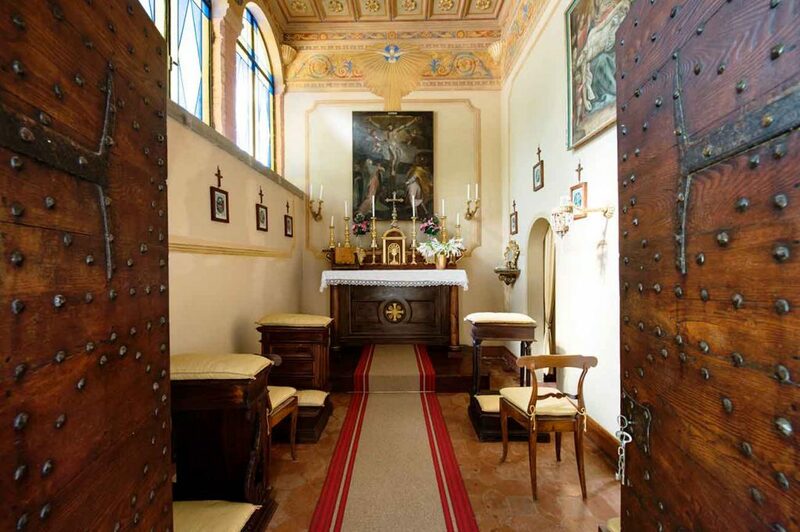 Outside of the Palazzo, next to the oldest building, there is a small 17th century consecrated chapel, dedicated to St. Charles Borromeo, with a small sacristy attached. 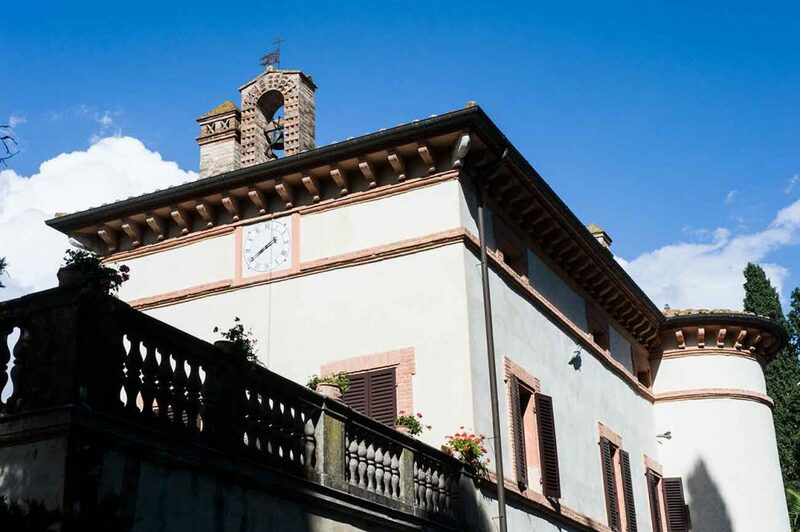 In 1700s, Countess Baldeschi Cennini (then owner), restored the still-working clock on the west facade of the palace. 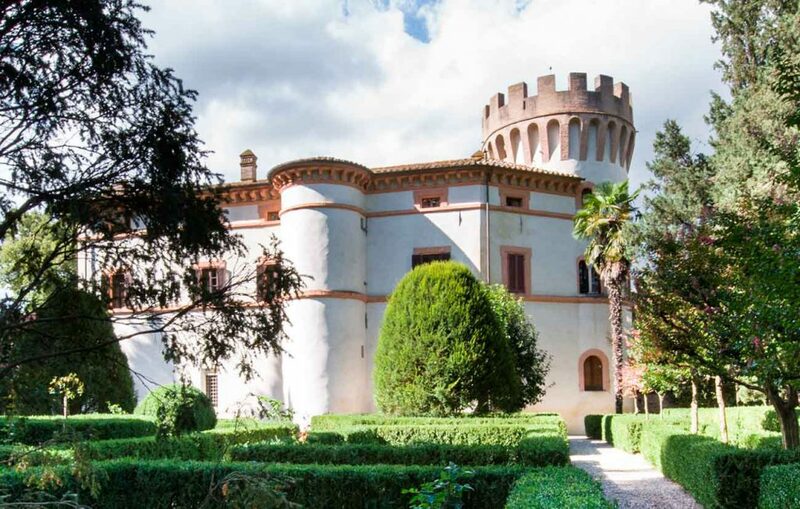 In 1901, the Bagnara Castle was purchased, along with the estate, by the Counts Giunta Tremi (current owners – great great grand nephews of emperor Napoleon Bonaparte), from Marquis Guglielmi, who had purchased it a few years earlier from Counts Conestabile della Staffa. The property went through restoration works from 1985 to 1987, having been damaged by the earthquake that struck Umbria in 1984. 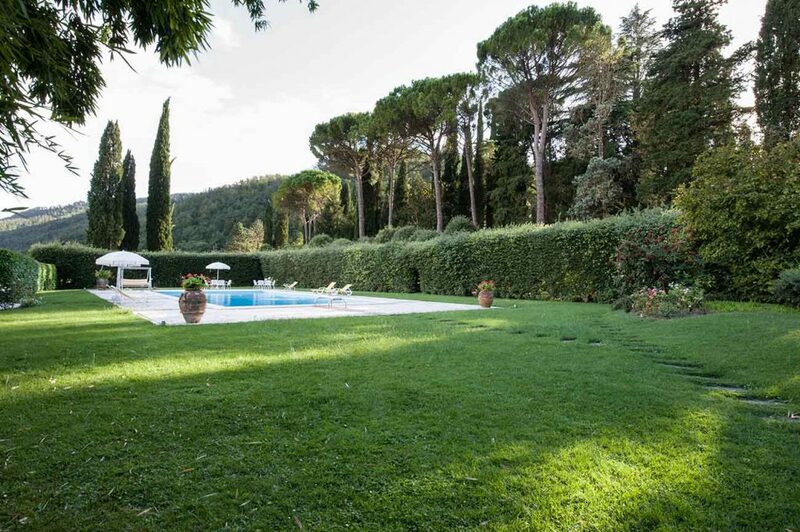 The property features a beautiful monumental park with “Giardino all’ Italiana” (Italianate Garden), protected under the Fine Arts department, of approximately 2,5 acre. 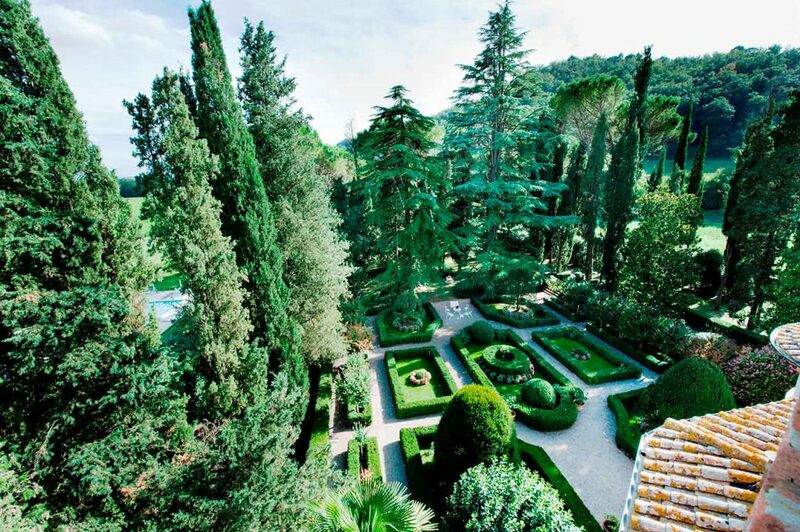 The Italian style garden features Lagestruemia trees, yew trees, wild roses, and begonias. The park currently features high monumental Lebanon Cedar trees, Live Oaks, Pines, Cypress and Holms, Magnolias and Linden, walls of Lauro Ceraso, flower bushes, and vines. Near the pool, there is a large clump ofbamboo. Among old prints found in the Perugia Archives, they came across the old garden drawing that showed a small building at the end of the 400s marking the center of the garden, still existing, and a Maze that went lost over the centuries.